All Shipmates can add their own personal photo galleries inside the gallery selections below. Click the images below to enter the gallery area. Then click the "Create Your Own Photo Gallery Here" button at the bottom of the page to participate. Follow the directions on screen to create your gallery. Only you can add photos to galleries you have created, and all photos you add will be credited to you inside your gallery! The USS Seattle AOE-3 ship's bell is a source of pride for all USSSVA members. 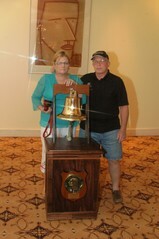 The ringing of the bell signify our members arrival adds that extra touch which allows our pride to show. The ringing of the bell during the time we honor our shipmates that have preceded us in death adds an extra moment of remembrance as we allow the echo of the ring to drift away.